The C&O Canal and towpath are truly year-round attractions within the Park. While biking, hiking, and running are enjoyed by many, it takes a true appreciation for cold weather to enjoy the park when the temperature drops and snow begins to fall. 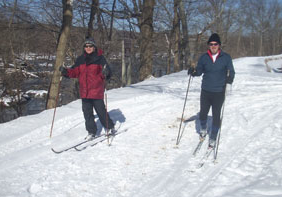 Snowshoeing and cross-country skiing are enjoyed by many along the entire length of the towpath whenever it dons a snowy blanket. The canal freezes, when weather permits, and ice skaters and pickup ice hockey games magically appear. Water levels in the canal are lowered during the colder winter months in these areas in order to help maintain the integrity of the locks, lift gates, and other historic structures that can be damaged by the freezing and thawing of the water in the canal. This creates the perfect conditions to take to the ice when the temperature falls. Ice conditions are not monitored by Park staff. (Skating is prohibited at Widewater and not recommended 50 feet from lock structures). 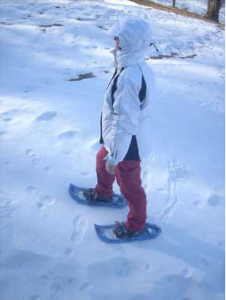 Visit the Park’s website for more information: http://www.nps.gov/choh/learn/news/ice-safety.htm. Head down to Brookmont outside of Washington, D.C. to see winter kayaking (yes, it’s a “thing”). Donning wetsuits, helmets, PFDs, a kayak and paddle, these hardy souls can often be seen lugging their kayaks from the Brookmont neighborhood, across the Clara Barton Parkway, and heading down into the frigid waters for a cold-weather workout on the slalom course in the feeder canal. Brrrrrr! There’s lots to do in the park in winter, but for those who prefer a warmer climate – reserve a stay at one of our award-winning Canal Quarters lockhouses – Lockhouses 6, 10, and 49 have heat!